The Cover Guy Roller Cover Shelf makes it easy to roll your hot tub cover from a stored position on the roller shelf back onto your hot tub. Use the four rollers on each arm and simply slide your cover to move it on/off. This lifter only requires half of the width of your hot tub cover. Also, it provides the option to use your folded cover as a table top when its resting on the lifter arms. Plus, is easy to install and easy to maintain! This completely assembled lifter only requires a screwdriver to mount it to the side of the spa. 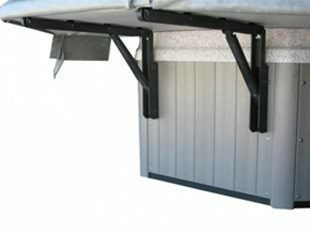 Often the first choice among customers for a hot tub cover lifter option. When your TCG Roller Cover Shelf is not in use you can fold up the arms against your hot tub out of the way. This makes for a cleaner look then your traditional hot tub cover lifters. The Roller lifter is manufactured using durable weatherproof materials, providing protection from the harshest of environments, prolonging the life of the lifter. All The Cover Guy products are brought to you with quality, safety, and value in mind as part of our commitment to customer satisfaction. Don’t forget to check out our other hot tub and spa products! As a one-stop-shop for your hot tub, we have everything you need including, covers, filters, lifters, chemicals and accessories!